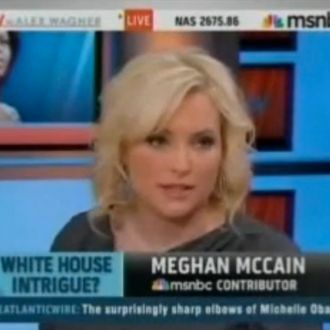 The last time Meghan McCain went to Brooklyn (publicly), she declared “Brooklyn in general is not a fun experience for me because I look nothing like Zooey Deschanel.” Last night, she returned once more into the land of dragons and bangs for a panel with her future coauthor Michael Ian Black in Greenpoint. He said something rather inappropriate about her mother, and her reply wasn’t a “but YO mama …”, it was “Oh my God. I am never coming to Brooklyn again.” We eagerly await further dispatches from McCain’s adventures in Kings County. Does she protest too much? Is she secretly living in Clinton Hill with three roommates who all split a CSA membership?